In Part 1, we talked about the importance of looking not only at customer acquisition but also customer development and customer retention. One of the main reasons for this is that since it costs 6x more to replace a customer than to keep one around for another year, a significant piece of your business development strategy should be devoted to both customer development and customer retention. As luck would have it, social media channels are much more effective at supporting those two efforts than they are at acquiring net new customers. So what exactly is customer development? It is the process by which an amateur customer learns to become a professional customer. If you are a cable company, it is the process by which you convert basic cable customers to premium cable customers. If you are an airline, it is the process by which you convert an occasional rate-shopping economy customer into one who knows how and when to upgrade. Even though he isn’t necessarily loyal to your airline yet, he derives enough utility from his knowledge of how to get the most out of his relationship with you that his fluency and experience create in him a preference for your airline. If you are a business solutions firm, it is the process by which a client moves from only hiring you to handle one business function to taking advantage of all of your services. In sales terms, customer development drives wallet share. In business development terms, customer development drives more revenue per billing period customer. What is customer retention? The natural extension of a superior value proposition. Perhaps you don’t win on price but the superior products and/or services are worth the extra cash. Perhaps your price is so good that customer will put up with just about anything you do to them. Perhaps you fall somewhere in the middle. Long term, customer retention is the process by which a customer with whom you have had a long and valuable relationship is made to a) stop actively looking for alternatives to your services, and b) is made virtually immune to competitors’ offers. The ultimate force behind customer retention is loyalty, and it is your job as a business to inspire that loyalty. There are lots of ways to do that (we will get into them during the course of this series), but what is important to note for now is that this is in an area where social media channels can prove particularly effective. If you think this is common sense, great. Of course it is. Except… look around. Is it? Very few companies devote any resources to a complete acquisition, development and retention model. What do most agencies and marketing departments focus on? Acquisition. What digital and social metrics are most valued? Pre-acquisition metrics (impressions, likes, follows, etc.). 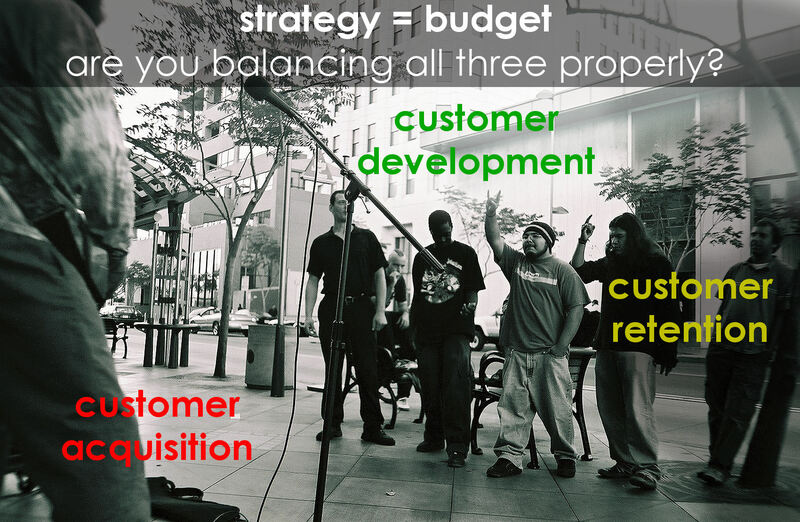 Customer acquisition budgets aren’t hard to come by but good luck finding customer development and retention budgets. Even if you manage to, are they anywhere near as healthy as customer acquisition budgets? Where is the lion’s share of the spend going in social: marketing or customer care? Think about it. Almost every company on the planet is doing social wrong because almost every company on the planet is focusing on the wrong thing and operating from the wrong assumptions. I can’t put all of the blame for this on social media gurus. The moment marketing took over social media duties was the moment social media became a marketing focus. When someone rhetorically asks ‘who owns social at your company,’ the answer should be ‘everyone.’ At the very least, it should be ‘marketing, PR, product management and customer care.’ 99% of the time, it’s going to be ‘marketing.’ Well, that’s not how it works. Not if you want your social activity to actually work for you. Content isn’t king unless content drives the right outcomes, and acquiring likes and clicks and follows aren’t what you should be focusing on. Developing and retaining existing customers should be driving at least 70% of your social activity. Customer acquisition should be number three on your list of priorities for social channels, and there, social should mostly augment your efforts on more traditional channels. The rest of the ‘acquisition from social channels‘ piece is organic anyway. Here’s the organic acquisition piece in a nutshell: loyal customers tend to recommend you to their peers (directly or indirectly). In other words, customer retention ultimately drives customer acquisition in social channels. Word of mouth. That whole WOM thing that was such a hot topic 10 years ago. It’s still relevant if and when you focus on the right things in social (and outside of social). And do you know what the best part of referral acquisition is? Unlike cold customer acquisition (advertising and marketing), it is already paid for. It’s a bonus for doing a good job. Social channels can be amazing to help drive referral business. The thing is, you can’t expect ‘content’ to drive that. This isn’t a 10 Facebook updates and 12 tweets per week play. That isn’t how it works. So to recap: we’ve established that driving more sales can come in the form of customer acquisition, customer development, and customer retention. Of the three, customer acquisition tends to be by far the most expensive (and the hardest to achieve because it comes with so many hurdles between discovery and first purchase). We have also established that social activity on social platforms may not be as effective at reaching masses of potential customers as other traditional means of mass marketing and advertising (including email marketing). The lesson: social channels may not be as immediately effective at driving customer acquisition as many businesses might have been led to believe. (Emphasis on ‘immediately.’ There is a longer strategy for customer acquisition through social channels that we will focus on later.) In the short to mid term though, the right kind of activity on social channels can be extremely effective at driving customer development and customer retention objectives. Perhaps more importantly, these results can start to be achieved fairly quickly and with minimal expenditure. Customer erosion: understand the problem before you adopt the wrong solution. Remember in Part 1 when I asked you to take a step back from social media and social media marketing, and asked you instead to think about your business? Let’s do that again. Think about why some of your customers or clients leave you or shop around or aren’t interested in more of your services. If you did your homework, you also have a firm grasp on your company’s customer erosion rate. And if you are particularly enterprising, you may have already even done the math: how much does losing a customer cost you both in terms of lost revenue (remember LTV?) and new customer acquisition cost (how much net marketing and advertising spend resulted in acquiring that replacement customer or client)? Now here is a question: You probably know exactly how much you have spent on customer acquisition so far this year. 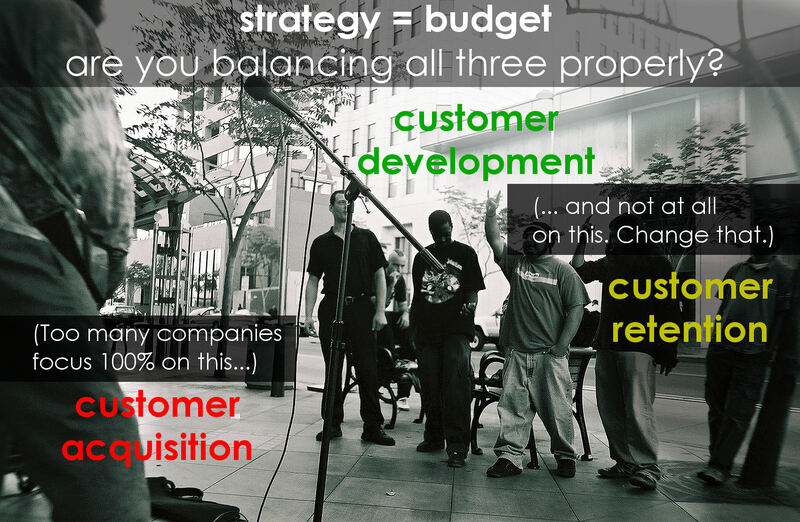 How much have you spent on customer development and customer retention? If you are like the majority of businesses, it isn’t just that you could be doing a lot more. It is entirely possible that your entire social media focus might have been entirely wrong until now. Like most businesses, you might have been driving the wrong outcomes and using the wrong metrics for years. We’re going to change that. In Part 3, we are going to apply the concepts introduced in parts 1 and 2 of this series and look at specific ways that you can start driving more business right away by using our existing social media framework. Until then, your homework is this: look at your customer/client database. Starting now, that group of individuals and companies is your community. That is what you will call it from now on. What I want you to do is identify the top 10% most active members of that community. Not necessarily the top 10% in spend (though you certainly should look into that as well), but the top 10% that you have the most contact with. It could be how often you talk with them or how much time you spend with them when you touch base. Your call. What I also want you to do is sort every account in that database based on transaction frequency. Who transacts with you the most often per year? Who transacts with you the least per year? (Find that bottom 20%.) Lastly, I want you to put together a matrix of your products and services (columns) and overlay that on top of your active customer/client list (rows). So for example, if your products and services consist of A, B, C and D and Company XYZ only opts into A and B but not C and D, your chart/table should have an X or a check in the A and B columns but the C and D columns should be blank. Don’t worry if you can’t do it all. Do what you can with the information that you have. In Part 3, I will show you how to use that data (or a general sense of what that data would look like if you had a way of capturing it) to craft the kind of social content and activity that will drive some business your way, and do so without having to acquire a single new customer. Good article waiting for the next one. Good read. Looking forward to the next instalment. Thank you.